Designed by Ralph M. Unger in 2003. Published by Profonts. 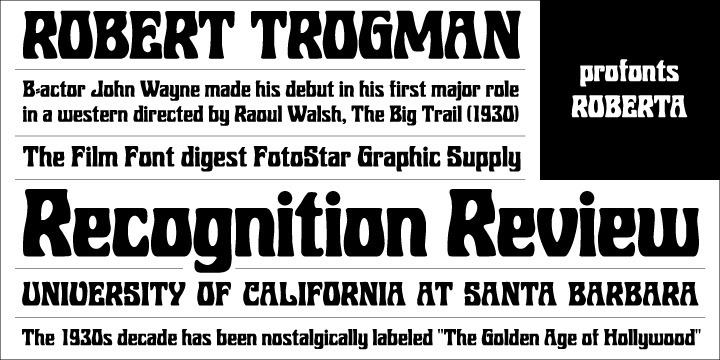 Roberta goes back to the old poster fonts of the 1930s. It is an excellent alternative and combination to fonts like Arnold Böcklin or Hobo. Roberta supports up to 73 different languages such as Spanish, English, Portuguese, German, French, Turkish, Italian, Polish, Kurdish (Latin), Romanian, Dutch, Hungarian, Serbian (Latin), Kazakh (Latin), Czech, Swedish, Croatian, Finnish, Slovak, Danish, Lithuanian, Latvian, Slovenian, Irish, Estonian, Basque, Icelandic, and Luxembourgian in Latin and other scripts. Art is not to be taught by words, but by practice.